Manager Neil Lennon is hoping Celtic will use the momentum generated by a good run of form to extinguish Arbroath's Scottish Cup hopes in Wednesday's replay at Gayfield Park. But he warns his players they must be in the right frame of mind to progress to a fifth-round tie at Raith Rovers. "You want to keep that feel-good factor going," said Lennon. "But the attitude has to be right. We will have to adapt to the conditions as best we can and play accordingly." Paul Sheerin's Second Division side stunned Celtic with a late goal in their Cup tie in Glasgow's east end at the start of the month, the 1-1 result earning them a lucrative replay against the Champions League last 16 side. 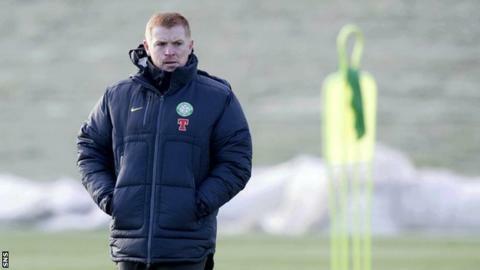 Lennon felt his team were unlucky not to have won that day but is taking nothing for granted for the televised replay. "We just didn't have the rub of the green," he said. "I felt we created a lot of chances, but we just didn't maximise them. That's what the Cup does sometimes. "I will go strong. The players are playing well and they just want to keep playing - a good match rhythm. "I haven't played there before, so it will be a new experience. We're taking the game very seriously. "It's a competition we have had recent success in and we would like to progress in it. It's a very important game." The manager pointed to cup wins at Berwick Rangers and in recent years as proof that his team can handle playing in less salubrious surroundings against hungry opponents. However, he is hoping the Gayfield pitch is in good condition for his players, who produced what Lennon called their best domestic performance of the season . Celtic coach Danny McGrain is a former manager of Arbroath. "And he said historically they always had a decent surface, so I'm hoping that's going to be the case tomorrow," he said. "If not, we will take the games as it comes. "It's dangerous for us and we will have to be on our guard. "I've been on the end of a few cup upsets in my time as player and manager. It's not a nice experience and I don't want that to happen tomorrow." Striker Gary Hooper will travel with the squad to Arbroath, despite being laid low with a virus for a few days, and Lennon is keen to have the player's long-term future secured sooner rather than later. "Whether it's this week or next, we are hoping to get his representatives up and really come to a positive conclusion," said Lennon. And, as the January transfer window draws near, he added: "We've been looking at players for the last two or three months now. "I am hoping to add to the squad if I can. If I can't, so be it."